How many of us go to a movie or a play—even a really good one—and a couple of days or weeks later don’t remember a thing about it? Yes, movies have a role in relaxation and just plain momentary enjoyment, but there can be something said for the longer term pleasure of ruminating over the themes, questions and ideas presented in good art. Note: if you know even the basics of Turing’s story, there is only one real spoiler below (so marked). Before seeing The Imitation Game, I drew three cards each from the Petit Lenormand and a Tarot deck as separate readings. I wished to compare, in part, how the messages I received would differ in terms of plot versus philosophical themes, character dilemmas or spiritual content. I knew only the broadest outline of Turing’s achievement: the facts mentioned above. Fox is cunning, trickery, strategy; and in modern Lenormand can mean a job. Clover is luck, chance, risk, fortuitous, brief. Bear is strength, protection or envy; modern meanings include investment, gain and authority figures like CEOs or police and military. Tower reversed is averting disaster; bailing out; impotence; blocking or overturning destruction. Justice is measured rationality, seeing the pros & cons; choice; balance; decision; and, of course, law and justice. I considered that Justice in the center represented a balancing act between the Tower R and the Devil. Was shame (the Devil) somehow balancing an end to war (Tower)? Or was it more about needing to find a solution (Justice) that would keep the pressure-cooker from exploding (Tower reversed) that would let evil reign? Contemplating these cards since seeing the film, I see a much deeper issue hinted at by the movie—perverted justice done by a blind institution that causes great harm. I’ve learned from reading Lenormand that we have to see cards as being modified by what surrounds them. Justice doesn’t have to be reversed to indicate injustice—the Devil following Justice can show the great evil that justice itself can do. When a person is seen as “inverted” (“inversion” is an old classification for homosexual) then grave injustices are done. A point has been made that the royal “pardon” of Turing for his conviction as a homosexual is a travesty as he was guilty under the law and therefore “justly” convicted as were the 47,000 other men who were also convicted (and not pardoned). What we are shocked by is that a hero who saved millions of lives should have been treated so badly—but is that just to all the others? 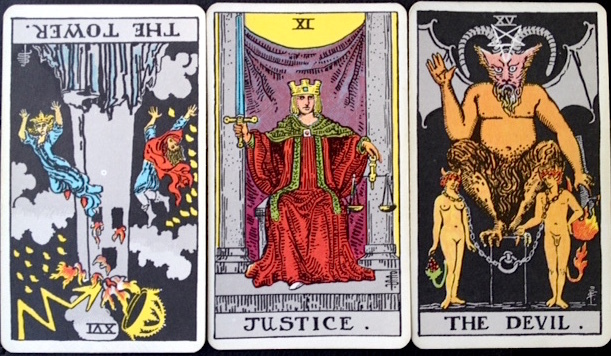 These cards indicate the reaction of today’s viewers that the “justice” against “inversion” was heart-breakingly “wrong,” while, according to the time, it was not, despite the fact that we now see the institution itself (the law) as as a great evil. Upon breaking the Enigma Code, the team is faced with the realization that they cannot stop the Nazi attacks as that would reveal to the Nazis the breaking of the code and the immediate termination of its use. British intelligence would have to allow the killing and destruction to continue in order to know what the Germans were up to. I see this horrifying realization as the main climax of the film, perfectly depicted by the Tarot cards: the breakthrough that could end the war and the decision to allow great evil to continue as the only rational thing to do. To achieve true justice and the reversal of a destructive course there will be collateral damage (bad things happen). I still find the Tarot to be the much deeper of the two decks, but the Lenormand cards astound me again and again with their uncanny precision and succinctness. As mentioned above, I’ll leave to you the implications of these cards to the Turing Test of artificial intelligence and his “Imitation Game.” Feel free to comment on these below. 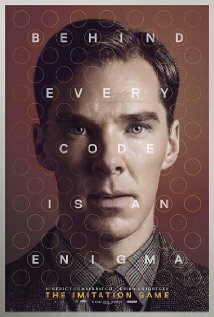 Great read on the Turing movie and the situation in general. I do love how the Lenormand deals so transparently with the practicalities while the Tarot almost always has something deeper (more strategic in this case) to impart. Yes, the readings I’ve done on films and plays has been incredibly rewarding and very helpful in terms of seeing how the decks operate in one’s life. Having the two different lenses to look through is very exciting. Even with the spoiler, I will see this film and ponder your clarifications. The cards have truly shown truth and focuses on the writer’s intent. Fox-Clover is an excellent combination for code-breaking, I agree! Cunning play – or the gentle art of permutation. Great article Mary. Thanks for your insight. It also struck me that whilst there was an outcry against the mistreatment of Turing, I am compelled to mention the insidious treatment of Joan (played by Kiera Knightly). She faced sexual discrimination for no reason other than being born a female. She struggled leaving her parents which resulted in Turing’s offer of marriage (hardly a satisfactory solution for a young woman whose own sexual needs could not be met). Society has not been just to women. With every victory that women overcome, the oppressive society continues to manipulate us through our bodies. Anything to make a woman not believe that she is amazing, smart and was born beautiful. Whilst we are changing our attitudes around homosexuality, issues for women remain complex. 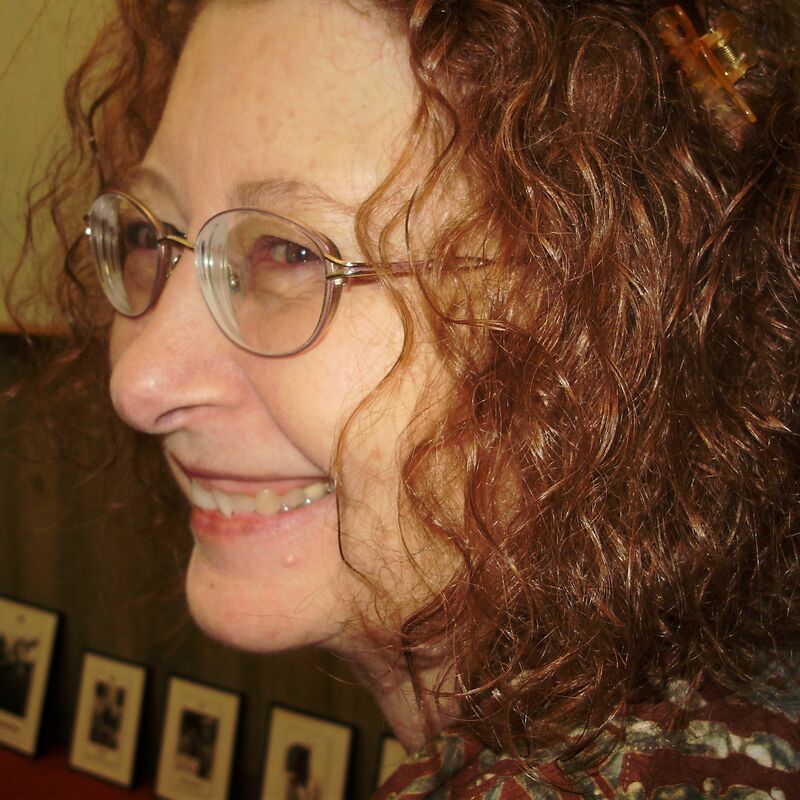 The oppression continues…….and it is insidious! Thanks for your comments. Do you see these insights in the cards I drew, or would you like to offer us your own card reading on the character and issues of Joan? I’ve found the Tarot to be very powerful at helping me find the core conflict that a character faces in a story as well as cards for what motivates them—for what they want. love the idea of doing a tarot reading before going to a movie. just a thought, though regarding the tarot: i don’t use reversed cards (just negative positions). so the tower card could at it simplest imply chaotic upheaval – it sort of looks what europe looked like during world war ii. bringing balance back to the world – the justice – card, was in fact done by the devil card working at it’s best. After all “hacking” into someone’s secret code doesn’t always end a war ;). perhaps, the movie brings the war – tower – as the back ground situation to question what justice is (also in the turings personal story as you pointed out) – and what devilish behavior is and through whose eyes this judgment is made. The cards and the person drawing them have, I hope, established a mode of communication that may be particular to them. So, while the meaning of a card upright is always significant, I believe a reversal is trying to tell me something worth considering – some more specific nuance than just the upright would suggest. While I did bring in some additional information, especially about the injustice of the law against homosexuals, my intent was to focus on the themes emphasized in the film as an art/mind/emotion experience.